Orchestra Makassy was formed in Uganda by Mzee Makassy together with a number of Ugandan and Zairian musicians. In 1975 they were forced to leave Uganda and took up residency at the New Africa Hotel in Dar es Salaam, Tanzania. At this time many of the popular hotel bands were comprised of Zairean musicians who sang in Lingala, and later modified the music to fit the inflexion of the Kiswahili language. Another performer at the same hotel, namely Mose Se Fan Fan, joined the band and the first four tracks presented here were recorded with him as leader. The song Chama Cha Mapinduzi, in praise of the Tanzanian independence party, has lyrics based on the words of the country's first president, Julius Nyrere. Remmy Ongala sang with the band during this period until such time that the band re-located to Nairobi. 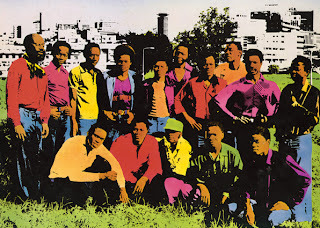 These songs, recorded by Radio Tanzania Dar Es Salaam (RTD) during 1975-1980, were later updated in the studio for the Agwaya sessions that found release in the UK on the Virgin label in 1982. As usel,h another very great post! thanks once again Matt - great recording! come on people, dig out those vinyl's and get them to this site! What can I say other than fantastic! 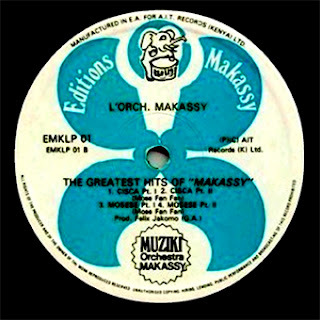 Orchestra Makassy always was and will be one of my favorite african bands. I could never understand why they stopped recording or performing this terrefic music.Was totally swept away by the Great Guitar, Bass and lovely rhytms on Agwaya. Never knew about these radio recordings before and it's awesome to now have both recordings! ( the other still available through sterns music - Legends of east africa) Big Thanks! Despite the crap recording quality, I prefer these recordings to the more "sanitised" Virgin sessions. Thanks for posting these impossible to find gems! Question for you though, Matt: where did you find Siku ya Kufa? I'd not heard it before and it sounds like a Remmy Ongala composition, although it was evidently recorded with Makassy. The only reference to it I could find was in Prof. Endo's discography (apparently re-recorded in 1988). The version of "Sika Ya Kufa" which I listed in the Remmy Ongala discography is, apparently the same one recorded by Makassy that Matt has posted here (vocals by Remmy). It was re-released in '88 by WOMAD on the LP "Nalilia Mwana" and credited (incorrectly) to Remmy Ongala & Orchestra Super Matimila). Since you've mentioned it I really should insert a note in the discography clarifying the matter! BTW, I wonder why WOMAD or Realworld or whoever has never issued that great album in CD?